As a surprise for D, I booked a cruise to Cozumel. Neither of us had ever been on a cruise before. It was always one of those "someday" things. We both grew up in families that either didn't vacation or vacation consisted of road trips. Cruises were something for "other people" and not us...people who won things on game shows or something. I was really surprised about how affordable cruising is for the money, especially if you live near a port city. 1. Booze Cruise. When we told people we were cruising Carnival out of New Orleans, we were wished luck. It was also the first time I heard the term Booze Cruise. Apparently, some Carnival ships were trying out all you can drink for a set fee. Ours wasn't. Still, NOLA is a party town and people get wasted on Bourbon Street and continue the party on the short cruise to Cozumel racking up huge bar tabs. One couple at our dinner table had an $1400 bar tab...mind you, this is a four day trip. When we cruise again with the kids, we will not be sailing on a short trip out of NOLA on Carnival. Too many drunks. 2. Sailing in the winter means rough seas. While the prices are awesome to cruise in the off season, you run the risk of really choppy seas. This means the ship will be rocking back and forth and side to side. Even if you are sober, you walk like a drunk. Some of the drunks may find this helpful in making them walk straighter. Luckily, I don't get sea sick. The rocking made me tired. I could fall asleep pretty much any time I sat down. The other downside is water-based excursions may be canceled. We had planned on riding in a submarine to look at coral reefs. Instead, we had to reschedule on a bus tour with all the old people. It wasn't bad...just not what we had planned. Cold coconut water! And a bit of wind. . .
Our ship wasn't able to dock where it was supposed to. All the beaches on that side of the island were closed. We ended up able to make a quick run in to the water. 3. All you can eat. My brother in law said if you weren't eating on the cruise, you were losing money. The food is a lot. Pretty much any kind you can imagine will be available at some point. I'm a bit of a food snob and while the food was good, it wasn't amazing. And there weren't any cheese grits at breakfast. Many of us were making our own. Juices were available all the time. Soda costs extra. We brought our own in our luggage. 4. Fine Dining. I really wanted to take advantage of the formal dining. It was generally pretty good. I ate escargot for the first time and LOVED it. We even dressed up for the formal night. I made my outfit for the formal night. I was pretty pleased with how it turned out. With the seating, you are assigned a table. If you don't like your tablemates, ask to change! We suffered through two nights of not really liking the group we were with before we changed. The next group was awesome. We had a great time talking. 5. Pictures. When the crew aren't offering you alcohol every 10 minutes, someone is trying to take your picture. It's really obnoxious. The photos are generally cheesy (fake pirate, bad back drops), etc. All your photos are printed and you can select which photos you want. You aren't under any obligation to purchase anything. My mother-in-law encouraged us to buy at least one sheet. I opted for a picture that didn't look like we had it taken on a cruise ship. 6. Land legs. You know it feels like you're still moving after you get off the treadmill and it takes you a few minutes to get rid of that feeling? It's taken me a full day to get my land legs back. At night, I still felt like I was rocking a bit and a few times I lost my balance walking. D seemed to walk it off better than I did. And a last note...watch what you buy outside the country. If you pay with anything other than cash, you run the risk of the vendor cheating you on the exchange rate. Calculate it out and don't rely on the vendor to be honest. We bartered on a price in USD, and didn't check the exchange rate in pesos...and we're now filing a dispute with the credit card company. The amount in USD on our receipt is different from what we were charged. I really wish we would have listened to this warning from travel websites. I am so jealous!! 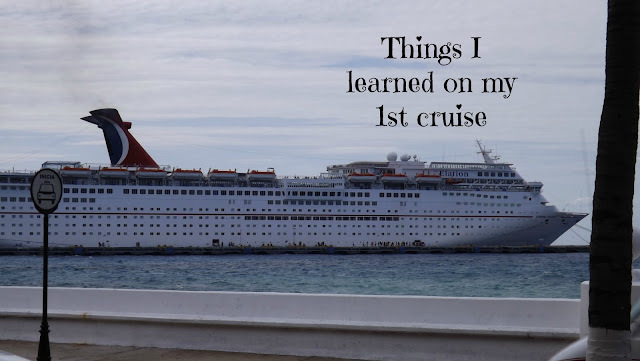 Hopefully someday I'll be able to put your good tips to use on a cruise!